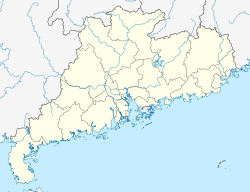 Luoyang (Chinese: 罗阳镇; pinyin: Luōyáng Zhèn) is a town and the county seat of Boluo County, Huizhou Prefecture, Guangdong Province, China. It is located on the Dong River. The China National Highway 324 connects Luoyang with the urban districts of Huizhou. Luoyang has a housing development area that is a replica of the Austrian town Hallstatt. This page was last edited on 28 May 2018, at 22:52 (UTC).